In this installation of Our Stories, Staten how he learned to be self-sufficient from he was young. For many people, Jamaica is pictured as an island paradise- white sandy beaches, a beautiful and vivacious culture, rich and wholesome food, and attractive people. And while that image is not far from the truth, if the lens is focused on the inspirational stories of ordinary Jamaicans, you’d find a sharper, richer and truer image of the Jamaican experience… this is Our Stories! He grew up in a remote community with his mother alone from the age of six years old. At times he had to go spend time with his father and he started working at an early age to help his mother. However, he has proven to persons that learning a skill can be very rewarding. Why did you have to work at an early age? I had to work at the age of twelve because I lived with my mother who was a single parent and she wasn’t working. I got a job at a garage doing various types of things such as keeping the garage clean. However, the owner had to close down the garage because he was going away so I was out of a job. What did you do after you lost the job at the garage? I tried to get another job but I couldn’t get any. I then decided to teach myself a skill, which is to cut hair but I didn’t have the right tools. So a friend of the family got some used tools and I went around in the community to get jobs cutting both children and adults hair under trees. It was rough because the tools were not so good but I had to work hard until I got assistance to buy some new tools. Ok, Staten, you said you taught yourself barbering, can you tell me how you did this? Of course, I started by getting scissors. Then I would use the scissors to practice cutting my little cousin’s hair who was also living in the yard. I would take my time to cut his hair and make sure that it was cut good. I also tried to remember how the barber cut my hair and do the same thing in his hair. When I was finished persons living in the yard would tell me that I did a good job and this really motivated me. I realized that teaching yourself a skill can be rewarding. Indeed. You now own a shop. What is the name of your business? How did you manage to get a lot of customers? 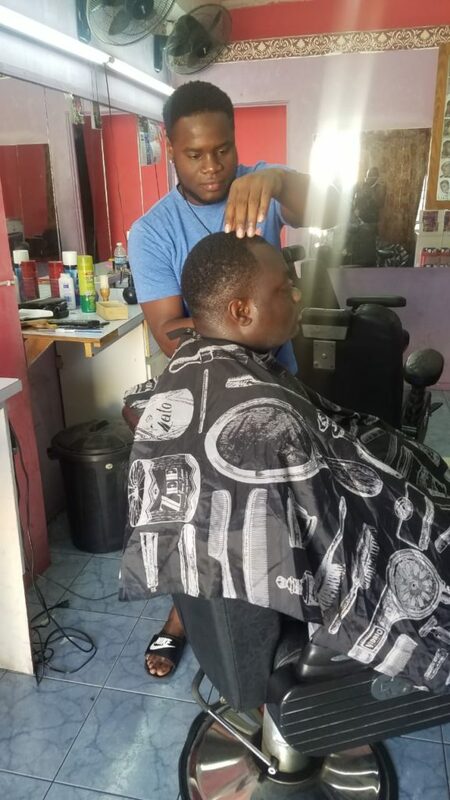 Yes, I did but I had to work under a tree in my yard until I got a space at a barbershop…I had to teach a young person to assist me because the customers were satisfied with the job I do so they told others and they came to have their hair done too. 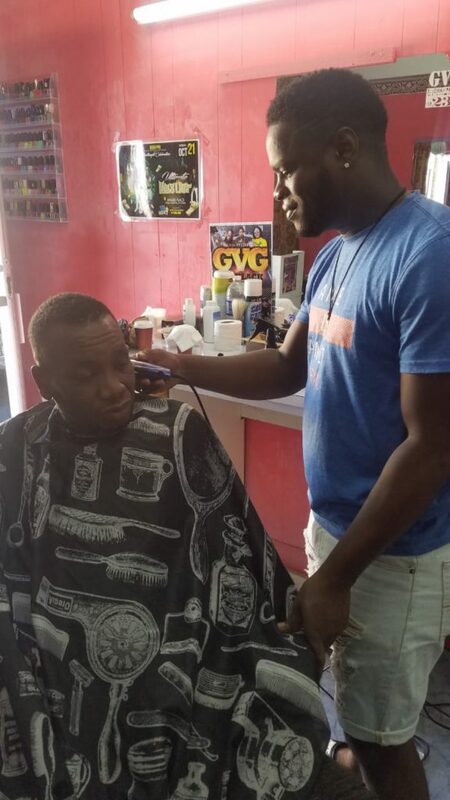 I had to get a shop for myself because the space was too small and the owner of the barbershop was getting jealous. Did you go anywhere to get further training? Not really. Only while I was at the shop that I used to work I would look at how the barber did some of the hairstyles. Approximately how many customers do you get on a daily basis? During the week it is a little slower than on weekends. On weekdays I get about ten customers each day but on weekends I get thirty customers each day. 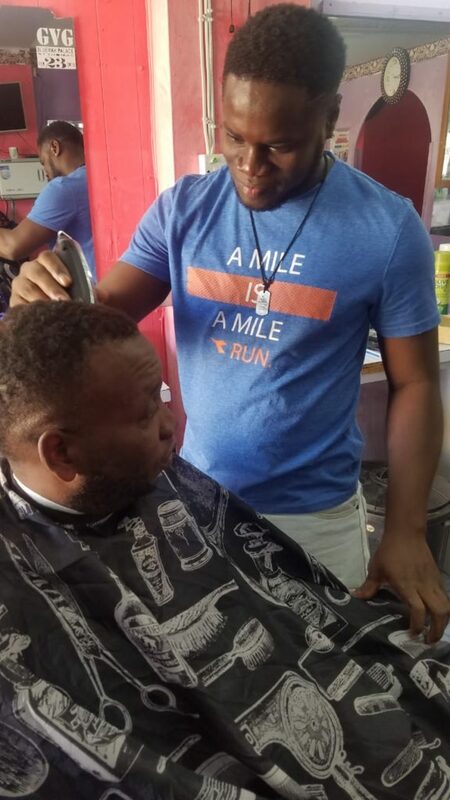 Apart from cutting men’s hair what else do you do at your shop? I cut women’s hair too and shape their eyebrows. I also cut men’s sideburns. No, because I love what I am doing and I have a successful business. How has this business helped you? It has helped me to be a better person and I have gained a lot of friends. I can take care of my family and pay my bills. Parents asked me to cut their children’s hair for free. I also help young people by teaching them the skill and contribute to fundraising activities. What is your vision for the business in the next five years? My vision is to get another shop and train more young people to help me. Also, to get a young lady to do facials for my customers. Thanks for sharing your story Staten!